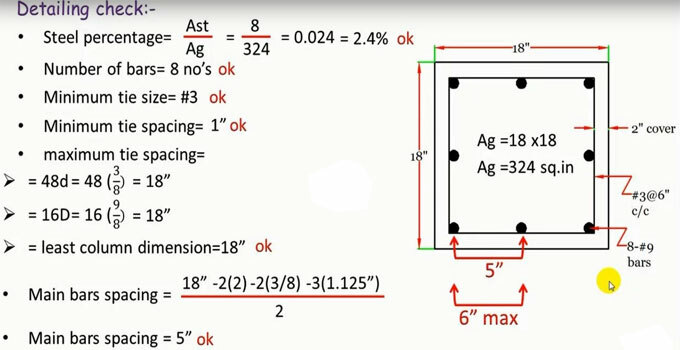 In this construction video, you will be familiar with the detailed process for creating design of a square reinforced concrete tie column by adhering to ACI codes. The video focuses on ACI-318 requirements for columns. ACI-318 comprises of the materials, design, and construction of structural concrete essential for buildings and where relevant for non-building Structures. The Code also highlights the strength evaluation of prevailing concrete structures. In ACI 318 is available in printed and digital formats and can be accessed on desktop, tablet, and mobile gadgets. It is obtainable in Spanish, Chinese, and Korean. Ratio of longitudinal steel must not be lower than 1% nor surpassing 8%. Minimum four longitudinal bars should be utilized with rectangular or circular ties. Minimum six longitudinal bars must be utilized with spiral ties.